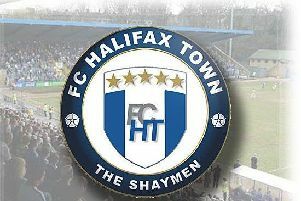 FC Halifax Town’s seven-game winning run came to a brutal end at home to Brackley Town, who produced a stirring second half comeback to win 3-1 and retain their own unbeaten record on their travels. The Shaymen seemed comfortable at half-time, courtesy of the excellent Jordan Sinnott’s beautiful strike, but three unanswered second half goals from the visitors condemned Town to their first home defeat since August. Billy Heath claimed Sinnott “ran the first half” against FC United of Manchester in Tuesday’s splendid 3-1 triumph and he was on top form again in the opening period against Brackley. At the heart of everything good about the Shaymen’s performance, Sinnott scored, was actively creative and was a constant thorn in Brackley’s defence throughout the first 45 minutes. It was in fact, however, Sinnott’s midfield team-mate, Liam King, who had the game’s first chance on seven minutes. Josh Macdonald burst past Alex Gudger down the right and cut the ball back perfectly for the captain who could only fire over. That started a spell of decent Town pressure with David Lynch unlucky to see his volleyed effort deflect narrowly wide. Sinnott then nearly caught Laurie Walker off guard from the resulting short corner with a sumptuous curler which drifted off target before the former Altrincham man produced a teasing low cross which no one in a blue shirt could convert. Walker was called into action on 17 minutes when Sinnott’s dangerous long throw was flicked on by Tom Denton allowing Alex Simmons to head goalwards but Walker produced a smart instinctive save. Although the visitors forced five corners in the first half, Town goalkeeper Steven Drench remained untroubled. And it was his opposite number Walker who was soon retrieving the ball out of his own net. To be fair, not many goalkeepers in the country would have kept out Sinnott’s fabulous strike. Macdonald tormented his full-back again and encouraged Sinnott to shoot first time from the edge of the box. The end product was superb, as the ball delightfully nestled into the far top corner with Walker clutching at thin air. It was Sinnott’s seventh goal of the season in all competitions, and second in five days, and added to his collection of other stunners against Altrincham and Ashton. He was denied another super goal in injury-time at the end of the first half when Walker flung to his left to somehow tip his 25-yarder around the post. Halifax were made to wait to commence the second half proceedings as Kevin Wilkin kept his side in the dressing room – it may have had something to do with a Billy Heath side beating a Wilkin outfit on the last three occasions, including a Wembley success for North Ferriby United against Wrexham. And Wilkin looked destined for another defeat when Macdonald took aim with his weaker left foot from 30 yards. But, fortunately for Brackley, the ball ricocheted off the inside of the post and into the grateful arms of Walker. That let-off proved to be the decisive moment as the Saints turned the game on its head during 13 disastrous minutes for Town. Out of nothing, Lee Ndlovu outjumped a watchful defence to glance in an equaliser from a corner. There was, however, no time for the Shay faithful to digest what had occurred before Brackley went in front a mere three minutes later. An excellent run and cross by Glenn Walker down the left was converted easily by Steve Diggin for his eighth of the campaign, but worse was to come when Ndlovu raced clear to beat Drench at the second attempt. Not disheartened, the Shaymen tried to salvage something from the game with King shooting wide before forcing an outstanding save from Walker but Town’s seven-game winning run came to an abrupt end. FC Halifax Town: Drench, Roberts, Wilde, Garner, Hotte, Lynch (Hibbs 66), King (C), Sinnott, Macdonald (Kosylo 87), Simmons (Peniket 66), Denton. Brackley Town: L Walker, Myles, Gudger, Byrne, Graham, Dean, G Walker, Armson (Lowe 90), Ndlovu, Diggin (Moyo), A Walker. Subs not used: Pitt, Moore, Noon. Scorer: Ndlovu (63, 76) Diggin (66).